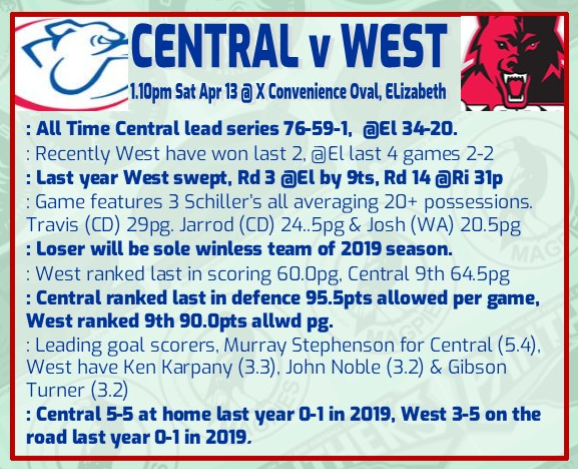 Central District has been forced into at least three changes for its must-win clash with West on Saturday. Key defender Nick Madden (finger), utility Jordan Furnell (hamstring) and promising midfielder Brendan Dew (knee) were all unable to be considered for selection. Former Norwood backman Ryan Llewellyn is in line to replace Madden while utilities Sam Hanna and Frazer O’Gorman give coach Roy Laird some flexibility. Goalsneaks Isaya McKenzie and Michael Ortiz could provide some punch inside 50m with Ortiz, set to play his first League game for the club after moving from Port Adelaide in the off-season. West Adelaide has been dealt a defensive blow ahead of its contest against Central on Saturday. Former Norwood backman Pat Levicki will miss the next 4-6 weeks after injuring his knee in the Round 2 loss to North Adelaide. The tall defender is joined by fellow recruits Jade Cleeland (back) and Dallas Willsmore (suspension) as being unavailable to face the Bulldogs. Premiership defender Errin Wasley-Black heads the list of inclusions, which also comprises wingman Nathan Batley, utility Aaron Anderson, Thomas Pillion and Patrick Fairlie. Watching nearly a half of Reserves footy at Elizabeth. 3 players behind the ball, all players camped in one half. Probably West's worse game for a fair while. They looked slow and Central waltzed through a lot of their tackles. A few Bloods might have an earlier start next week. 12 goals kicked on a decent day for footy. Sounds dull. It was. It wasn't a good game to watch. I worry about the way footy's going as a spectacle. Lee wrote: It was. It wasn't a good game to watch. K worry about the way footy's going. Yep, 80 is the new 100 as far as a 'decent score' is concerned. Happy we got the win,but everytime we play West the games are low scoring dull boring encounters and terrible to watch.